Not only is this Vegan Mac & Cheese Nachos recipe dairy free, soy free and nut free… it’s also creamy, comforting and perfect if you’re craving both vegan mac & cheese and nachos! Am I the only one that craves both, like always? Today, I’m going to show you how to turn basic vegan mac & cheese into a creamy, pub-style, vegan Mac & Cheese Nachos! You guys LOVE my Vegan Nachos recipe, as well as Vegan Mac & Cheese recipes, so I thought why not mix these two amazing dishes together. Whether you need a family-friendly (and fun!) vegan dinner for the weekend or finger food for when guests come over, this unique vegan mac & cheese nachos has your back! And now I’m going to show you how to take any mac and cheese dish, and transform it into fully-loaded vegan mac & cheese nachos. If you want to view or print the recipe card, just scroll down for the full list of ingredients and simple instructions on how to make this creamy vegan mac & cheese nachos. 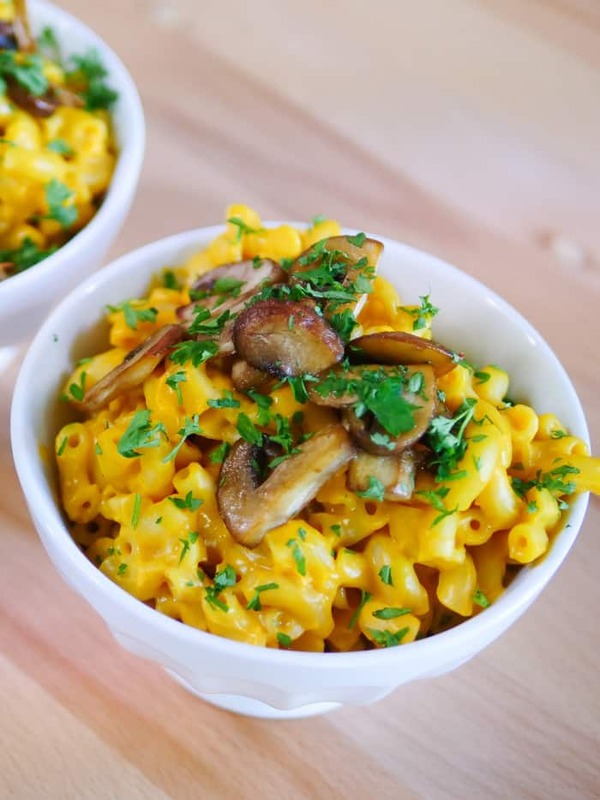 To begin making this vegan mac & cheese nachos recipe, you first want to already have a basic mac & cheese ready by taking macaroni pasta and a vegan cheese sauce! You can get my #1 Cheese sauce recipe on page 34 of my Edgy Veg Cookbook, or my vegan nacho cheese sauce recipe online (which you can make in bulk and use for mac & cheese or other cheesy recipes). So first add your macaroni and warmed vegan cheese sauce in a pot. Next add 1/2 cup of black beans, 1/2 cup of corn, and if you like things hot, you can add 1 chopped jalapeno, but it’s totally optional. Now mix them together. And if you want your dish extra super gooey and cheesy, add more cheese sauce based on preference. Now for the nachos, take a baking sheet and line it with tortilla chips of your choice. And then throw the mac and cheese on top. 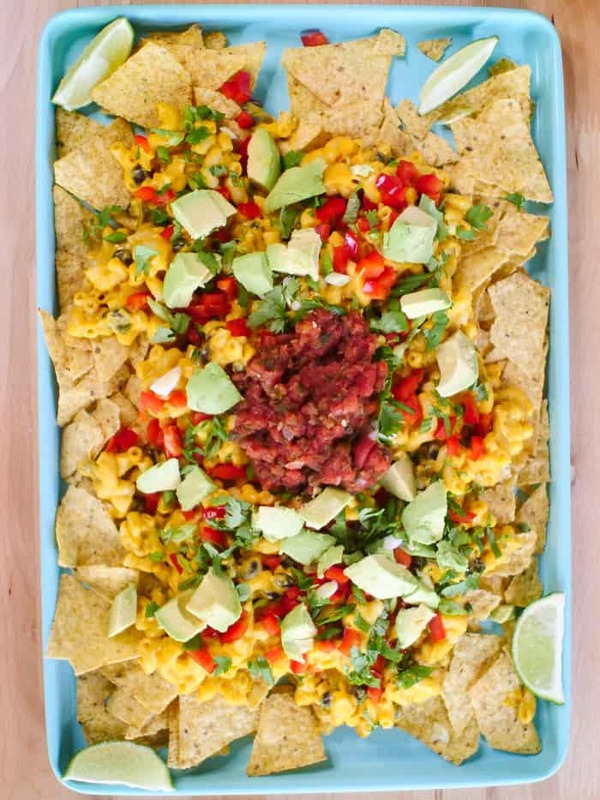 Because I want to make this recipe super delicious, decadent and a little over the top for my guests to be like “OMG WOW THIS LOOKS SO GOOD”, we’re going to add whatever you like on top of your nachos. As a result, I added 1/2 cup of diced red pepper, 4 chopped green onions, a handful of chopped cilantro, 1 diced avocado, 1 large spoonful of salsa in the middle (or vegan sour cream) and served with lime wedges on the side. And that’s how you take a boring mac and cheese and level it up to a fun and crowd-pleasing vegan mac & cheese nachos that’s also soy and nut free! Add your cooked macaroni and warmed vegan cheese sauce in a pot. Add ½ cup of black beans and ½ cup of corn into your pot. Now take a baking sheet and line it with tortilla chips. Pour your mac & cheese mix on top of chips. Add ½ cup of diced avocado, 1 large spoonful of salsa in the middle (and whatever else your heart desires as a topping) and serve with lime wedges on the side. You guys must try this Vegan Mac & Cheese Nachos recipe, you will love it! Once you try it, come back and leave me a comment below with your feedback and star rating! If you make this, let me see! Tag @edgyveg on your photo & add the hashtag #theedgyveg in your caption so I don’t miss it! I’ve never tried mac & cheese on my nachos but I will for sure give it a try.